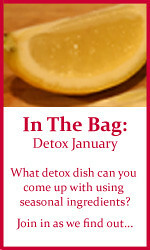 Get detoxing, guys and gals! 1. Participants should attempt to use all the ingredients ‘in the bag’ for that particular month, but may leave one out if they prefer. 2. Participants can include any extra ingredients that they see fit. Is it too late to make something tonight?